Natalie Lobue is a gifted healer who uses specified meditation techniques and sound healing in her sessions to facilitate healing, growth and change. Guided meditation and trance-medium work with Acutonics tuning forks and Crystal Tones singing bowls create powerful shifts to health and awareness. Natalie helps identify the root cause of pain and suffering with her meditation and uses calibrated vibrations to pour music through the body to create health and change-a very relaxing and validating experience.She helps with chronic and acute health issues, infertility, trauma, emotional and spiritual pain, feeling stuck, inter-generational patterning, and holding patterns. With clear understanding of the origins of our pain and the wisdom and profoundness of sound healing we can reach deeper levels beyond what we anticipate. Each session is completely different and unique to each client. Natalie also offers Group Sound Baths with Crystal Tones singing bowls. She plays an array of crystal singing bowls to help pour vibrations through the mind and body. This creates a space for deep relaxation, opening and release, stress relief, clarity and ease. We reach deep states of relaxation and allow the nervous system to heal, the parasympathetic nervous system to regenerate our bodies, and our mind to balance the right and left hemispheres of the brain. 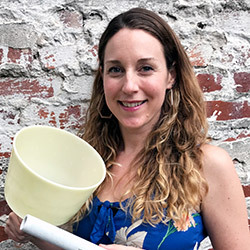 Natalie is a Reiki Master, a trained intuitive and trance-medium healer from Aesclepion Healing Center, an Acutonics Practitioner, has studied Michael Harner’s CoreShamanism, a graduate of the Kairos Institute of Sound Healing, the Acupressure Institute, and received her BA from SFSU. Your personal information is important to me! I promise not to share it.